Could your wallpaper and paint be making you sick? We spend a lot of time inside in our lifetime. There are estimates that we spend over 90 percent of our lives inside, which means that the air quality in our home and office is going to have a huge effect on our overall health. While we can easily avoid having dust, allergens and some chemicals, there are chemicals that we cannot avoid completely. 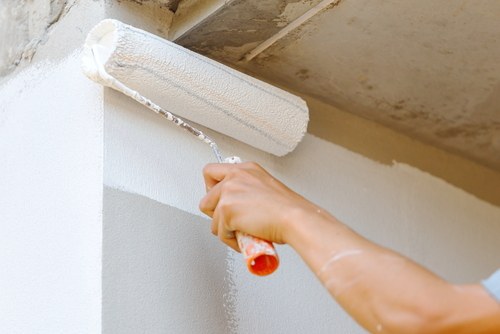 Paint and wallpaper can be made with chemicals that could be making us sick. One of the most known chemicals that was used in paint and wallpaper in the past was lead. Lead can still be found in paint and wallpaper that are in homes that haven’t been renovated in the past 50 years. These lead based paints and wallpapers are still very dangerous, even after all this time. Children have gotten lead poisoning from eating paint chips and pieces of wallpaper. There are even reports of children becoming sick from touching the walls, and becoming sick from placing their hands near their face before washing their hands. Exposure to lead has many effects on your long-term health. However, lead-based paint is not the only type of paint that you need to be careful of. There are many chemicals that are used to create paints and wallpapers that could have a huge effect on our health. Here are just a few risks of using paint and wallpaper in your home. Most people would like to think that they do not spend a huge amount of time at home, but when it is totaled up, we spend most of our lives at home, inside. In our homes and at work is where we are exposed to the most amount of airborne pollutants. The EPA has found that 6 in 10 homes and buildings are classified as ‘sick’. Sick House Syndrome has become a growing problem because more household products are made with a huge amount of chemicals. We all know about the chemicals that are in cleaning products, but paint and wallpaper are two products that have been overlooked in the past few decades. Paint and wallpaper still are made with a huge amount of chemicals that most of us don’t think about or worry about. However, these chemicals are easy to breathe in because of their fumes and their drying processes. It is not just professional painters who are at risk for the side effects of the paint fumes, which is why you should limit your and your family exposure to these products. What Can You Do to Limit Your Exposure to Paint and Wallpaper Chemicals? Paint and wallpaper have different chemicals that are used to make and apply them. Most times, wallpaper is seen as the less dangerous of the two options, but there are chemicals in the colorants that are used to create the print on the wallpaper. Most times, wallpaper creators will not have the chemicals that are used listed to make the wallpaper. The glue that is used to adhere the wallpaper is also full of chemicals. These chemicals can create fumes that you can easily breathe in. You can also get the glue on your skin, which could cause breakouts and chemical burns. You can limit your exposure to the chemicals that are in wallpaper by wearing a mask. There are also all natural wallpaper glue and eco-friendly wallpapers that you can use. These products can limit the number of harsh chemicals that you are exposed to. If you have to use chemical based wallpapers, you should wipe the wallpaper down after it has had time to fully adhere to the wall. This can help eliminate dangerous chemicals, especially if you have children in the home because the excess chemicals can stay on the top of the wallpaper for years. In recent years, paint and varnishes have become the more popular option for covering walls and furniture because they come in just about every color of the rainbow. While lead has been banned from being used in paints and varnishes in most countries at this point, there are new chemicals being used that are just as bad, if not worse. These chemicals are called Volatile Organic Compounds, or VOC, and evaporate into the air. This makes them very easy to breathe in if you are not careful. VOCs can be found in many products, not just paint. The issue is that they can cause sinusitis, asthma, fertility problems, birth defects, neurological disorders, and cancer. This can be very worrying, but you can still paint your walls without having to exposing yourself or your family to these chemicals. Paint is divided into two categories, which are water-based and oil-based. Water-based paints can also be called acrylic emulsions and are the most common type of paint that is now used on house walls. This type of paint has fewer risks than oil-based paints because they are low-odor, and many times do not have huge amounts of VOC’s in them. If you are worried about VOCs and other chemicals that could be used in paint, there are natural paints like the ones from Auro and New Life Paint, which are VOC-free and odorless. Natural paints also make it easy to clean your brushes after painting a room because you just need to wash them with soap and water. What if I Do Not Want to Repaint or Wallpaper a Room? Most of the danger of using paint stops after the paint is dry and the fumes have been removed from the room due to air flow. Lead has not been used in paints for decades, but if you are worried about lead in your home’s paint, you will need to have new dry-wall installed and paint the new dry-wall with safe paint products. There are lead testing kits that you can use to find out if the paint has lead in it. If it doesn’t have lead, most of the time washing the walls is more than enough to remove any chemical residue. Wallpaper has many chemicals in the paper and the glue. This is why it is not the preferred option, especially if you are trying to avoid having chemicals in your home. If your home has wallpaper, you can reduce the amount of chemicals that you are exposed to by wiping down the wallpaper regularly. The best option is to remove the wallpaper altogether because the paper or cloth that was used to make it could be holding onto chemicals, dust, mold, and other harmful airborne pollutants that can make their way into our homes. With most of us spending over 90 percent of our lives inside, it is disturbing to think about how many chemicals that are allowed to be in our paint and wallpaper. Today, there are more paints and wallpapers that are eco-friendly or have lower amount of dangerous ingredients available for people are redecorating their homes. Low-fume paints have been recommended for anyone who is worried about the chemicals in paint. If you need to repaint or wallpaper your home, you should make sure that you wear a mask and have all the windows open. Taking these precautions will help reduce the amount of chemicals that you and your family are exposed to.